The Longxing Pagoda is situated at 260 kilometers south of Beijing in Zhengding County, Hebei Province. It was built in 586, during the Sui Dynasty, and enlarged in 971, during the Song Dynasty. 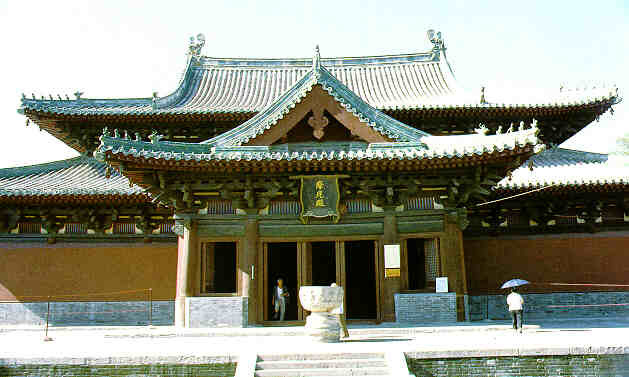 There are here the Hall of Heavenly Kings, the site of the Hall of the Six Non-Buddhist Teachers, the Mani Hall, the Ordination Terrace, the Maitreya Tower, the tower housing a giant revolving bookshelf, the Hall of Great Mercy, the Hall of Amitabha, and the Vairocana Hall. The bronze statue of 1,000-hand, 1,000-eye Guanyin housed in the Dabei Pavilion, 21.3 meters tall, is one of China's earliest bronze statues. The pagoda has more than 50 stone tablets ,the most valuable of which is the one bearing an inscription about the construction of the Longzang Temple.